Primary goals: militant struggle against Sunni and Western forces in Iraq and Syria. Striving at a territorial contiguity between Iran, Iraq and Syria. 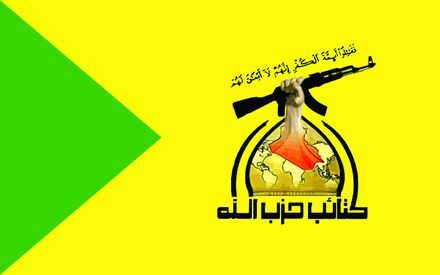 Establishment of an Islamic-Shiite state in Iraq. Area of activity: Iraq, Syria. Primary funding sources: abductions and collection of ransom money, aid money from Iran. The name “Kata’ib Hezbollah” (Brigades of the Party of God) may not be well known, but the Shiite-Iraqi militia, numbering a few hundred fighters, is responsible for some of the most lethal attacks carried out in the last decade in Iraq against coalition forces and the local Sunni population. Until the US withdrawal from Iraq in late 2011, the fundamentalist militia (backed and led by Iran and the Revolutionary Guard), carried out many attacks against American military forces and the coalition – and the Americans have a long and bloody account with the heads of the organization. The leader of the extreme militia, Abu Mahdi al-Muhandis, was among the planners of the combined attacks against the American and French embassies in Kuwait in 1983, along with the attempted assassination of the Kuwaiti Emir two years later. Under his leadership, Kata’ib Hezbollah was involved in many instances of murder, abduction and torture of the Sunni population, particularly in the al-Anbar district of western Iraq. Particularly brutal were the events that took place after the occupation of Fallujah by ISIS, throughout which, according to UN accounts, almost 900 people disappeared, among them dozens of Sunni children. Thousands were imprisoned and tortured and 49 men were executed or tortured to death by the extremist Shiite organization. Since the withdrawal of the Americans from Iraq and the increasing chaos in Syria, the Iranian hand has directed the militia forces further into Syria, where Kata’ib Hezbollah members are fighting to defend Assad’s regime and acting intensively against Sunni ISIS. Simultaneously, organization members are taking an active part in fighting ISIS in Iraq – alongside the Iraqi military and additional Shiite militias. They claimed victory in important battles in Fallujah and Mosul where they continued, per Iranian orders, to conquer important lands around the Iraq-Syria border. The moves led by the organization are of utmost strategic significance to the Iranians who aspire to complete their “Shiite Crescent” plan which would create territorial contiguity from Iran to Lebanon. Al-Muhandis is the senior field commander and one of the heads of the ‘Popular Mobilization Force’ – an umbrella organization leading the fight against ISIS in Iraq, that unites about 40 militias alongside the Iraqi army, most of them Shiite with close ties to the Revolutionary Guard. This is indicative of the power of Iran’s hold on the region and its influence over today’s Iraq. Practically since its inception, the organization has been heavily funded by its Iranian patron, that makes sure to devote money and resources for the organization’s activities. More can be learned from the same lawsuit filed by American veterans and the families of soldiers killed in Iraq against European banks. According to the statement submitted against the banking powers, HSBC, Credit Suisse, Barclays, Standard Chartered and the Royal Bank of Scotland, channeled money from Tehran to the terror organization in Iraq. These funds were allegedly transferred directly from Iran to Kata’ib Hezbollah in order to finance shootings and roadside bombings in which dozens of American soldiers were killed or wounded. The claim explicitly implicates Kata’ib Hezbollah as one of the main recipients of those funds, which according to the statement of claim came to over 100 million dollars. An additional source of income comes from abductions and ransom payments, which in the last year brought huge sums into the Shiite terror organization’s account. Kata’ib Hezbollah was the organization that headed the plan and execution of the abductions of 26 members of the Qatari royal family while they were on a falcon hunting expedition in December 2015. The dubious release transaction saw the royal family transfer an astronomical sum of a billion dollars to Iran and different terror organizations (which triggered the big boycott against Qatar by Saudi Arabia, United Arab Emirates, Egypt and Bahrain), and the Shiite organization is estimated to have received an especially hefty cut of the spoils. According to the Financial Times which exposed the details of the transaction, in exchange for the hostages’ release, suitcases loaded with cash amounting to about 700 million dollars were transferred to Iran and its ‘partners’.